By guest blogger and Guider Karen. 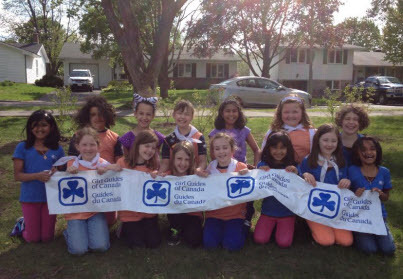 Karen is a Guider with the 36th Ottawa Brownies, and wrote a Trial By Fire series for GirlGuidesCANBlog: First Impressions, My First Unit Meeting, Girl Guide Cookies, A Week in the Life of a Guider, Girl Engagement – the what now?, and Reflections of a First-time Guider. Read more from Karen on her personal blog Virtually There. This entry was posted in Awesome Activities and tagged environment, meeting ideas, TD Tree Day, td tree planting grant. Bookmark the permalink. You go girl! I love how you had a vision and didn’t give up on it! When we Guiders have great ideas we are passionate about, that’s when the girls get excited. I’m sure these girls will always remember this! Bravo! What a great experience for your Brownies! I know both my daughters and my Sparks moving up to Brownies would love to plant some trees and proudly tell everyone that this is their tree. Well done! Our district also had a TD tree planting grant and planted over 800 trees in a local walking trail . Great spirit Karen, you do amazing things. That is why Guiding is so great in Community 28 and elsewhere. Karen – That’s terrific! We’re hoping to plant trees this year if we can get a grant (our annual local event fell through for the first time ever this year and the girls were very disappointed). We’re also in Ottawa and your story was very inspiring. For me, seeing the wonder on a girl’s face when she’s done something she had no idea she could do, is one of the BEST parts of Guiding. – Jenn Hilliard, 3rd Riverside South Guides.